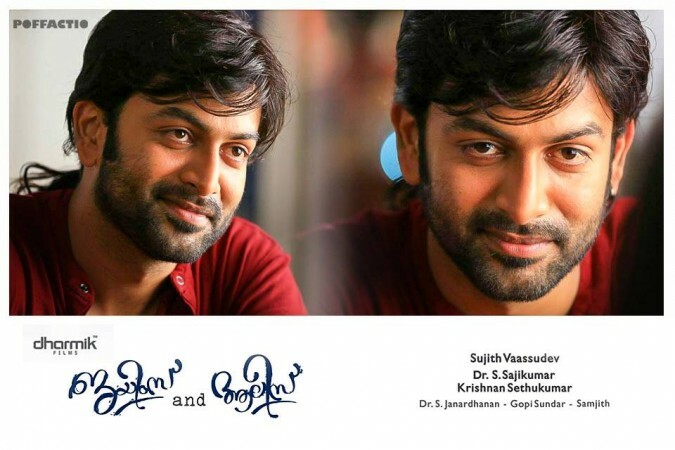 "James and Alice" marks the comeback of Prithviraj and Vedhika after their hit Tamil movie "Kaaviya Thalaivan" in 2014. Prithviraj Sukumaran, who is basking in the success of latest Malayalam release "Paavada", is all set to become the next trendsetter in Malayalam after Nivin Pauly in "Premam" and Dulquer Salmaan in "Charlie". The first look posters of the actor from his upcoming film "James and Alice" have been released and they feature him in a never-seen-before avatar of an artist. "JAMES..an artist, a lover, a vagabond. And then...life happened! 'James&Alice'," Prithviraj posted on his Facebook page while sharing the poster. James is a workaholic ad filmmaker and Alice works in the banking sector. The couple gets married against the wish of their parents and the movie revolves around the misunderstandings between them due to their busy lifestyles. The flick, which went on floors on 15 January, marks the comeback of Prithviraj and Vedhika after their Tamil hit "Kaaviya Thalaivan" in 2014. The movie is the debut directorial venture of cinematographer Sujith Vasudev and it has been scripted by Dr S Janardhanan. Produced under the banner Dharmik Films by Dr S Sajikumar and Krishnan Sethukumar, "James and Alice" also has Sai Kumar, Manju Pillai, Nedumudi Venu and Sijoy Varghese in significant roles. Apart from "James and Alice", Prithviraj also has a handful of projects, including Jijo Antony's "Darvinte Parinamam", RS Vimal's mega budget movie "Karnan", Jamesh Kottakal's "Beautiful Game", Pradeep M Nair's "Vimaanam", Rosshan Andrrews' "Naale Ravile", Blessy's "Aadu Jeevitham", Jeethu Joseph's untitled flick, Jinu Abraham's "Adam" and epic drama "Kunchirakkottu Kaali" in his kitty. Vedhika will next be seen in the Kannada film "Shivalinga" and Tamil project "Vinothan".